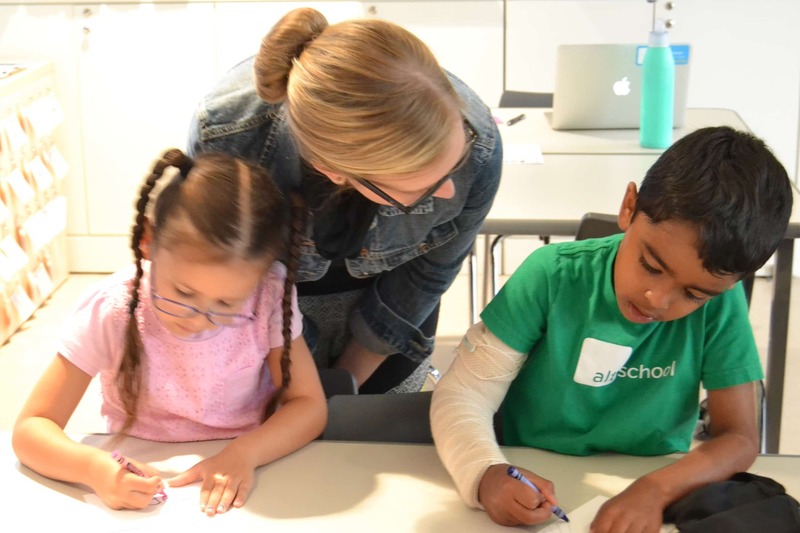 In this series of blog posts, AltSchool’s VP of Learning, Colleen Broderick, takes us through five elements of learner-centric education and shares how each element guides AltSchool’s pedagogical vision and development of practices and software. This is the first installment of five. 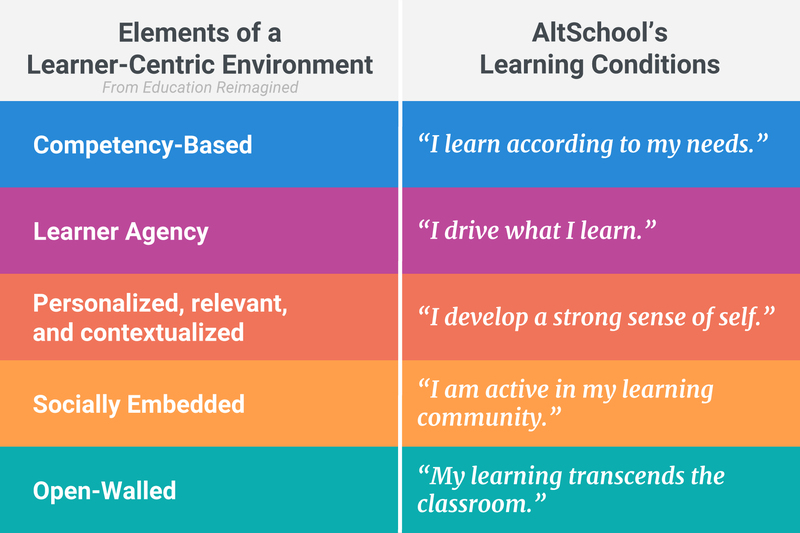 AltSchool is driving toward an educational vision that is committed to shifting the field from a traditional, teacher-centric model to one that is learner-centric. In traditional models, the teacher plays the lead role in determining what is taught, how it’s taught, and when it’s taught. Students are dependent on the teacher to craft their learning and provide opportunities to demonstrate academic understanding. In a learner-centric environment, however, students build a broader set of competencies that enable them to drive their own learning, both in school and beyond. Learner-centric environments commit to whole-child outcomes, including academic knowledge, skills, and habits. Read more about how these learning conditions fit Our Vision for Lab Schools. In this series, we explore each element and share how we enable it with our practices and tools. First up is a competency-based education, where learners learn according to their needs. Traditional education assumes learning outcomes based on a student’s age and past curriculum. One example: A 10-year-old in March of her 4th-grade year may receive a series of lessons about comparing fractions with different denominators because her class covered generating equivalent fractions earlier in the year. But what if our learner didn’t master the prerequisite concepts? What if she is still struggling with comparing fractions with similar denominators? In a traditional environment, students are usually promoted to the next level regardless of whether they’ve achieved all the targets. Grades only communicate a general sense of achievement, and they don’t address the gaps in learning. In a competency-based model, however, a student learns according to his or her needs. Students continue working on developing a competency until they have demonstrated mastery, regardless of age. They get what they need, whether that’s hands-on time with equivalent fraction bars or word problems involving fraction multiplication. At all times, students are progressing toward mastery based on their existing competencies and what they’re ready to learn. The teacher’s role in a competency-based environment is to guide students, beginning with clearly communicating what they need to know and be able to do so they can partner productively in their learning journey. Part of this role is ensuring students are working at the “just right” level and make resources and help available to them as they progress. Three assessments offer teachers insight into whether a student is working at their "just right" level. In competency-based education, teachers also engage in assessment for learning, in which students engage in several low-stakes, formative assessments. These informal checks for understanding do not interrupt the learning process. Formative assessments like exit tickets, graphic organizers, or student reflections are generally not graded like a summative assessment; instead, students receive actionable feedback on their work, and teachers and students use these assessments to inform future instructional strategies. Finally, we have assessment as learning, also known as student-driven assessment. Students generate their own ideas of how to demonstrate understanding, taking responsibility for their own progress. Student-driven and formative assessments should be constantly informing a learner’s trajectory, determining when learners are ready for a summative assessment of learning. So, what does this look like at AltSchool? As an education and technology company, we always start with educational practices before we start designing any supporting technology. Middle School educators at our Yerba Buena lab school started this year with a science project called The Viral Video. A quite literal interpretation of the title, the project culminated in student-produced short films (the summative assessment) about a particular virus, its history, method of transmission, symptoms, treatments, and prevention. From the launch of the learning experience, students understood the targets they had to demonstrate. Throughout the unit, students completed science labs, wrote storyboards, answered questions about viruses, created video drafts, and more. All these formative assessment opportunities helped teachers and students determine what parts of this project required further practice and additional instruction of key concepts before the summative assessment. The collaborative nature provided plenty of opportunities for self- and peer-assessment, as students played different roles, such as scientist, scriptwriter, and film editor, and worked together to produce their final product. These opportunities to self- and peer-assess highlight the power of assessment as learning. Using models, students were able to reflect on learning and set goals to improve their work. 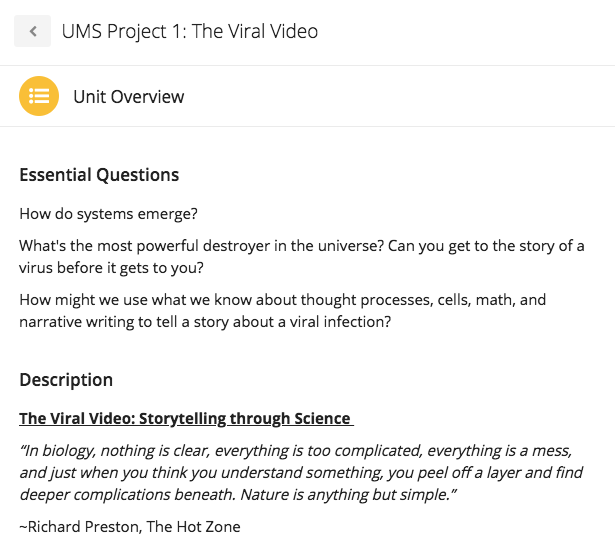 The unit AltSchool teachers created for their Viral Video project. AltSchool’s platform supported each part of the process. From the very start, teaches gave students a clear picture of learning objectives in the Unit while giving students considerable freedom in reaching those competencies. Students completed formative assessment cards throughout, arming teachers with data about individual and group needs for future instruction, and providing students with valuable feedback on their work. Individual students had different cards on their Playlists depending on the role they played in their group project, giving them opportunities to determine for themselves what skills and knowledge gaps they needed to fill on their way to the summative assessment. Students drove their own learning, with teachers, aided by the platform, acting as their guide.